Stunning coloured, genuine Sleeping Beauty Turquoise and Herkimer Diamond pendant mounted in 925 sterling silver. This most beautiful of crystals, Turquoise has been prized across the globe for thousands of years. It is considered one of the Master Healing Stones and legend has it that it will change colour to warn the wearer of impending danger! It purifies, strengthens and enhances all four energy bodies and when coupled with Pearl it can be a great emotional balancer whilst also helping create focus to aid personal goals. The various varieties of Turquoise around the world each differ slightly in colour and some have slightly differing metaphysical properties. These include: Tibetan Turquoise (contains the OM vibration, pale greenish/blue in colour. Often Chinese Turquoise is passed off as Tibetan, so always try to buy from a trusted source), African Turquoise (quite green), Chinese Turquoise (also quite green/blue), American Turquoise (turquoise) Sleeping Beauty Turquoise (one of the best – pure deep turquoise in colour; the benchmark in turquoise). Sleeping Beauty Turquoise takes its name from the only place in the world it is mined; Sleeping Beauty Mountain in Globe, Arizona. The mountain was so-named because it is said to resemble a slumbering maiden, or 'sleeping beauty'. 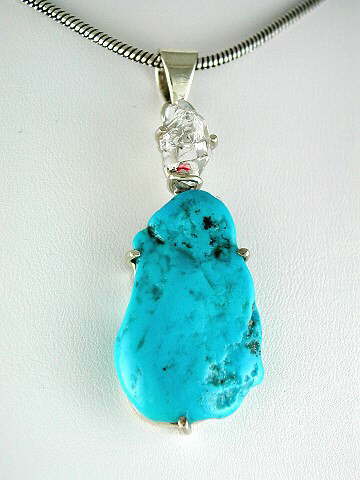 Coupled with this beautiful, natural piece of turquoise is a vertically-mounted Herkimer 'Diamond'. Not actually a diamond at all, Herkimer 'Diamonds' take their name from where they were first discovered; Herkimer County in New York. They grow in soft mud and form in a diamond-shaped crystal, hence the name, 'Herkimer Diamond'. Energizing, enlivening, creative - these are the keywords for Herkimer Diamonds. Herkimer is a stone of psychic ability and inner vision. They clear the chakras allowing for spiritual energy to flow in and assists in spiritual attunement of the highest order. They activate your light body and make super gifts; linking people together who have been parted. The are also one of the strongest crystals for clearing electromagnetic smog or pollution, so are excellent when worn by office workers or those exposed to such negative effects. All in all, a beautiful and spiritual combination.